As Game of Thrones hurtles toward its endgame, moments of joy and lightheartedness will probably become pretty scarce. 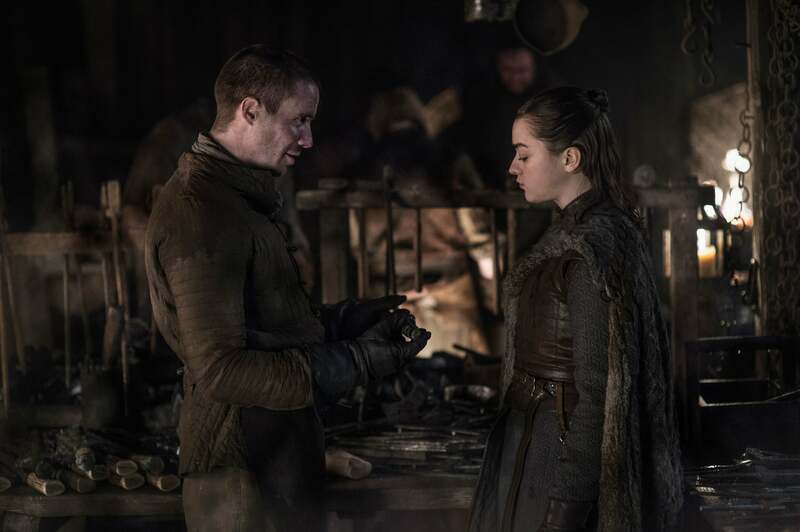 But viewers were treated to at least one sweet, funny scene in the season premiere when Arya Stark reunites with her old friend Gendry for the first time in several years. Now that they’re both older, it wasn’t hard to notice some pretty overt flirting between the duo. Like many Thrones characters, though, their ages aren’t always clear — here’s what we do know about the fan-favorite duo and just how age-appropriate their fledgling romance might be. Arya’s age is pretty easy to pinpoint. Back in an early season one episode, she actually states her age on screen as 11. With seven years having elapsed on screen, just like in real life, Arya is now 18 years old. It’s Gendry whose age has never quite been confirmed. The illegitimate son of Robert Baratheon is already a skilled blacksmith by the time we meet him in the earliest episodes of the series, which would indicate that he would have to be at least in his late teens. The A Song of Ice and Fire novels explicitly indicate that Gendry is about five years older than Arya, which would have put him at 16 in season one and 23 currently. Complicating matters, though, is that a season two episode has Gendry mentioning that he’s worked for blacksmith Tobho Mott for 10 years, which would probably mean he’s a little older, maybe around 20 years old in season one and 27 now. The ages of the actors themselves might indicate that the show’s version of Arya and Gendry have a slightly larger age gap than their book counterparts. Maisie Williams turned 22 years old on April 15, the day after the season eight Thrones premiere, while Joe Dempsie is 10 years older, set to turn 32 on June 22. Both actors are, in all likelihood, a little bit older than the characters they play, so the best guess would be that there’s probably a nine- or 10-year age gap between them. While that might be a hurdle to a romance in other shows, an age gap is one of the smallest complications when it comes to relationships on Game of Thrones!